You’ve probably heard about CPR, right? It’s a certification that anyone can earn to help someone in medical distress. But did you know there is a similar program to help people learn how to provide first aid in the event of a mental health crisis? It’s called Mental Health First Aid. Licensed clinical social worker Patricia Graham from Hartford Hospital’s Institute of Living has details. Q: Give us an overview of the mental health first aid program offered at the Institute of Living. A: Mental Health First Aid is an international program originating in Australia in 2001 and now offered in more than 20 different countries and has been offered in the U.S. since 2008. The Youth Version was created in 2012 and is meant for adults who work with youth, typically between the ages between 12-18 years of age. Mental Health First Aid is an 8-hour certification course meant to help participants identify signs and symptoms of depression, anxiety, psychosis, and substance use. The Youth version offers additional education regarding working with youth and how to differentiate between signs and symptoms of mental health problems and adolescent development, because sometimes it’s difficult to differentiate the two. For example, I work with adolescents who are experiencing psychosis, some of the signs and symptoms when it’s beginning to develop can look like typical adolescent development. Q: What are some of the risk factors and warning signs that you teach participants to recognize? A: We teach signs and symptoms of mental health problems, signs being things you can see, for example an individual withdrawing from family and friends when they didn’t before and symptoms which is what individuals experience, for example feeling lethargic. MHFA provides education on the differences between depression, anxiety, substance use, psychosis, and suicidal thoughts. MHFA also provides the next step of not only identifying the signs and symptoms but what you actually do and what you can say. I find teaching this course, many people don’t know what to say, often thinking they may say the wrong thing and when we don’t know what to say we often do nothing. Q: Once a mental health first aider establishes there may be a crisis…what do you teach them to do? In terms of the youth version, we utilize specific scenarios which are tough to handle, taking participants through the ALGEE action plan, including crises such as suicidal thoughts, non-suicidal self-injury, panic attacks, and disruptive or aggressive behavior. Q: Can anyone sign up to take this course and become certified? Or are there specific qualifications in order to participate? A: Yes, it’s meant for the general community who typically don’t have experience in the mental health field, you do not need any particular qualifications to participate. The Youth version is great for teachers, coaches, parents, and those who work with youth in any capacity. The more to be trained the better. There is a standard version of MHFA and the Youth version and both are very different, with different manuals, I encourage people to take both if they are able. 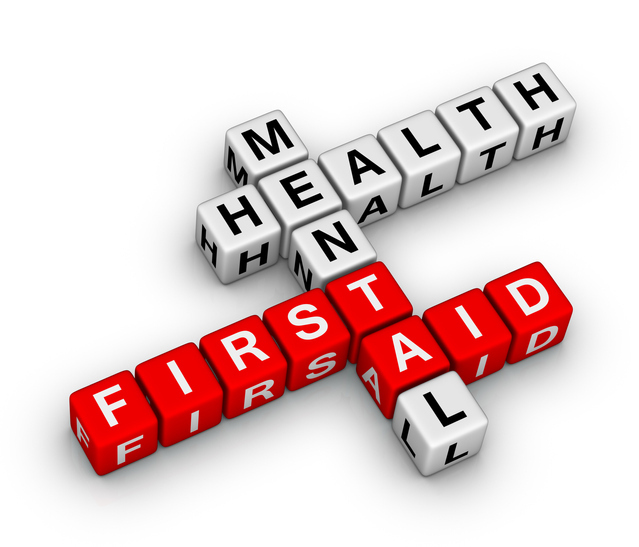 To register for a FREE Mental Health First Aid class, click here, or call 1-855-HHC-HERE (1.855.442.4373).